Our son’s first year in big school ended so soon. He wasn’t ready yet to say goodbye to his teacher, his first crush in school, and to his classmates, some of whom he considers his best friends. He keeps telling me he misses them, and I keep telling him that he’ll see them again because they’ll still be in the same school when classes resume this June. Last Monday, we (me, Justin and his Dad) went to his school to get his report card. I knew he was happy to see his classroom adviser, Ms. MJ Bordan, but he was a bit shy because it’s been almost a month since he has last seen his teacher. Justin is an incoming Grade 2. He, together with his classmates and the rest of the Kinder 2 pupils, will skip Grade 1 due to the implementation of the K to 12 Program this coming school year. Because it’s the last time he’s going to see Ms. MJ (kinder and grade school have different buildings), I made sure I had my camera with me because I wanted to take a picture of the two of them. I also asked for Ms. MJ’s Facebook name so I can share this souvenir picture with her, but unfortunately, I couldn’t find the FB name she gave. That made my son sad again. 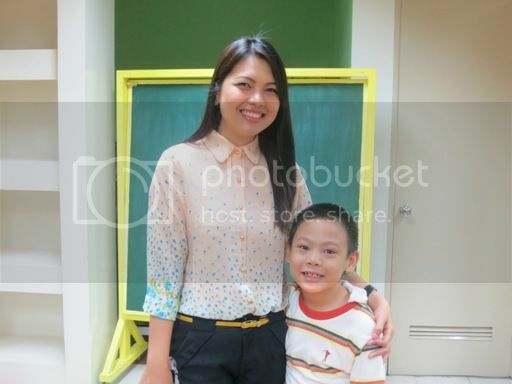 I told my son that he can visit Teacher MJ again when school opens this June. This entry was posted in Big School, Grade-Schooler, Report Card. Bookmark the permalink. 3 Responses to Kindergartner No More! Justin is very bright! Look at all those grades! 🙂 I’m sure you’re more excited than him this coming school year. My boy will be kindergarten this SY, too. Gets me all giddy! 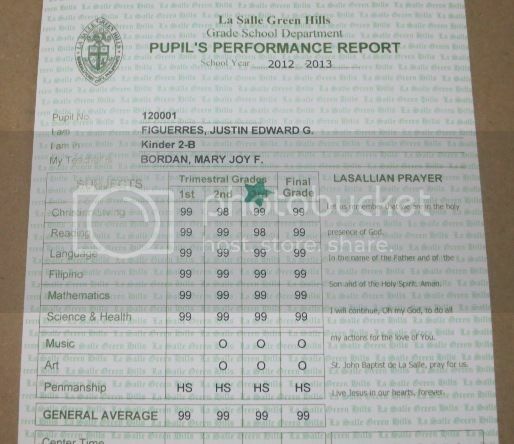 congrats Justin, I hope you’ll also like your grade 2 teacher just as you favored ms. Bordan. Goodluck to your studies and always keep it up. Cheers to mommy Tetcha for being such a great mom..
← Win an Amanpulo Getaway from Power Plant Mall’s Summer Shopping Raffle!